"Imagine if you had spent the whole first part of your life trying to walk on your hands. The clumsiness of it, always falling over, always stumbling, always the last at everything. Imagine the joy of discovering that in fact you could walk on your feet after all." It is a simple, whimsical and crudely humourous book meant for children. Which, of course, is why I liked it. Hiccup Horrendous Haddock III is an unnoticeable, average looking Viking. He is not quite up to the standard expected from someone who happens to be the heir of the Hooligan tribe. Not to mention, Hiccup has a very lazy and inefficient dragon, Toothless, who is about three times smaller than most dragons! As the tribe hunts for a hundred year old treasure, Hiccup turns out to be the most unlikely Hero of the story. 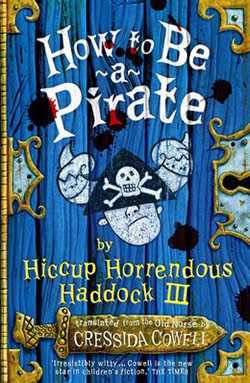 I liked How to Be a Pirate; a quick fun read, full of silly jokes and goofy cartoons! I find parts of it very original; like the dragons have their very own language. For instance, "Pishyou na munch-munch di miaow-miaow" means "Please do not eat the cats." I loved the movie How To Train Your Dragon - so I didn't bother reading the book. As it turns out, the two are quite different; though I might just be partial to the movie just this once, if only because Toothless happens to be exceptionally cute. Cute and yet profound teaser. That is such a cool teaser...book sounds awesome. What an awesome teaser and I love the cover of the book! Great teaser!! 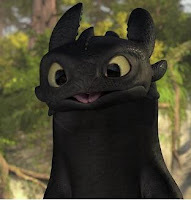 I ADORE toothless!! In big movie form and in pocket size book form ;) And yes! They are soo different from movie to book form but they are both so uber cute!! Love love love your teaser! Now come let me tease you here! And while you at it check out our awesome Giveaway for your chance to win not only books but jewelry!